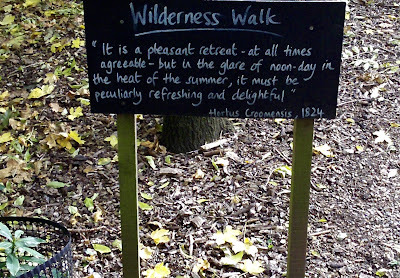 It says: "Wildernss Walk - It is a pleasant retreat- at all times agreeable- but in the glare at noon-day in the heat of the summer, it must be peculiarly refreshing and delightful." The above name, if I have spelt it correctly has even defeated Google. It comes from Coombe Park, the place we visited last week in the blog. Words, written, spoken, read and listened to, have been one of the most important driving forces in my life. I love the fact that these written texts are placed for people to read upon their walks. it seems a natural thing to do and greatly adds to the experience. I remember years ago walking The Cotswold Way, near Dursley being delighted and engaged with the mini poems ( postcard size) of Tom Clarke which were lovingly spread throughout the wood. Once again the word lives on. Here is my blog posting. Landscapes( 0f the mind): Croome views. Behind closed eyes I see sloping upwards, a forest of pine spreading out before me. encased in silence in the landscapes of my mind. within the landscapes of my mind. Where are the life sources? No sounds penetrate the air until like a lily pad opening I become aware of voices which sing in the wind and surround me unseen with sweet harmonies. Pleasant thoughts content me within The landscapes of my mind.